If you're looking for my "V" post in the A-Z Blogging Challenge, click HERE. ~ First things first: Mrs. 4444 is having a giveaway in honor of her birthday! I'm not going to divulge her age, but know that she's 1 year younger than I! If you don't already follow her, head over to see her! She is a HOOT!!! ~ Did anybody catch "Black Box" last night on ABC? I don't know where creators are getting ideas for some of these shows. It was really strange, but I couldn't stop watching! ~Another show I got caught up in last weekend is "Orphan Black" on BBC America. This one has to do with cloning. ~ YS earned quite the honor last night. 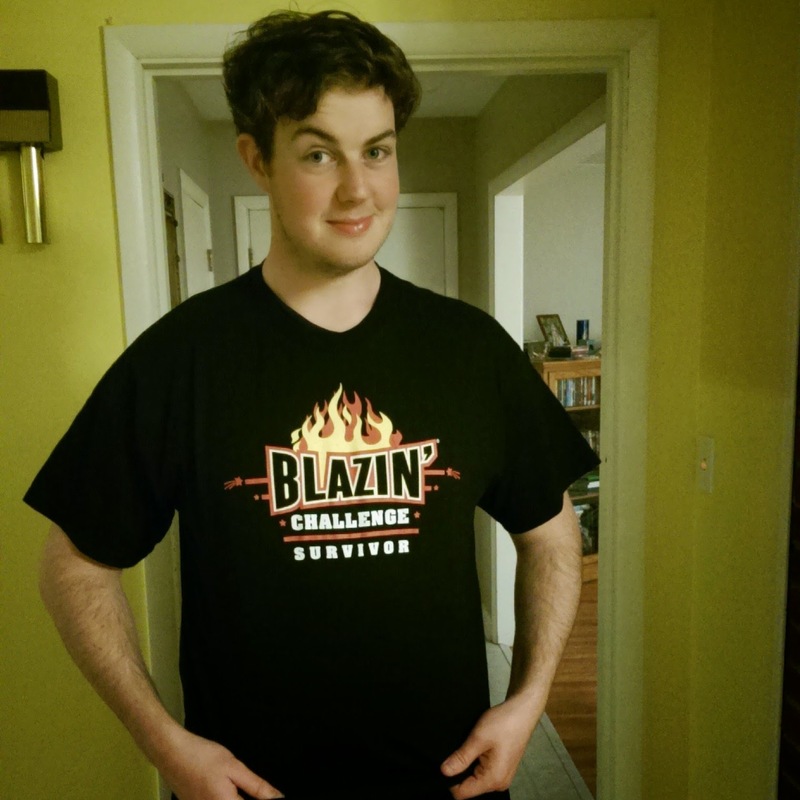 He beat the "Blazing Challenge" at Buffalo Wild Wings: He ate 12 blazing wings in 5 minutes and 31 seconds. His prize? A t-shirt and a picture on the wall. I have a feeling he's going to be taking several trips to the bathroom today! 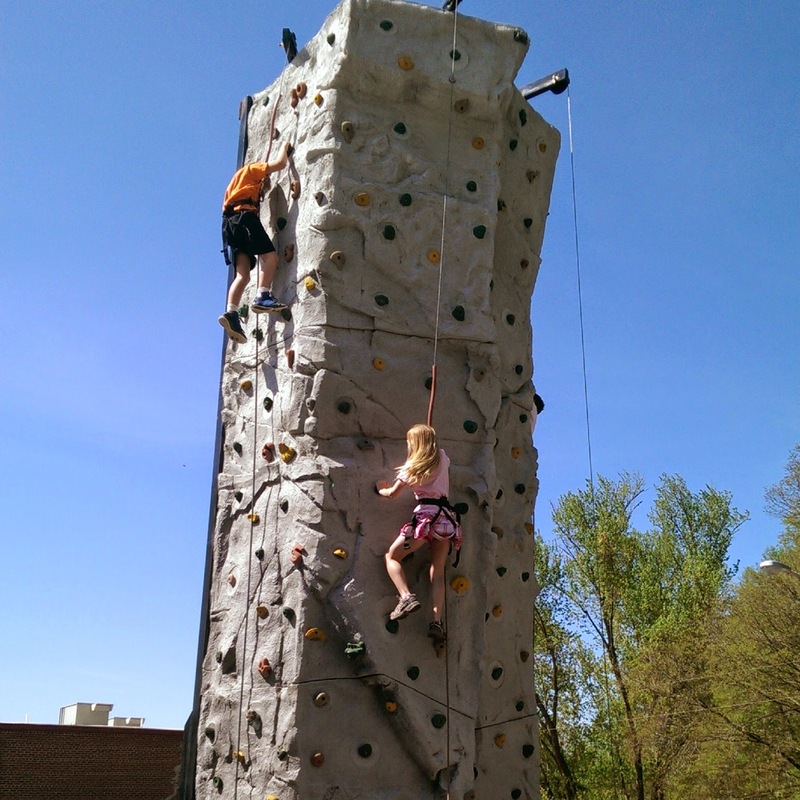 ~ Yesterday at one of my schools, students who beat the reading challenge got to take some turns on a climbing wall. It was a beautiful day for it! It reeked a bit of havoc on my schedule, but I was able to do quite a bit of paperwork and just breathe! 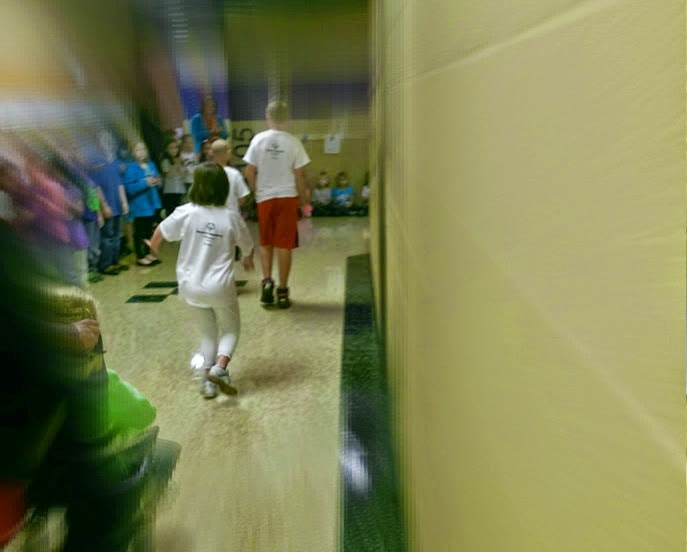 ~ Wednesday was Special Olympics. The olympians were met in the hall by every student in the school. It was so sweet to see how excited they were! I started watching Black Box but couldn't keep my eyes open... I wondered if it was good. I may have to catch it online. I've not watched either of those shows. Love the picture of your granddog! I didn't watch the new show but it looked intriguing. I just don't want to take on new shows, I tape way too many already. Way to go YS! I would love to be standing on that mountain top. Love your grand puppy.